Updated versions of the white tubes, with slightly subdued bluish tones. Very nice. Going to get these in the game now. Could use an underground set as well to differentiate from the surface tubes. Should we also have the Surface Roads ? 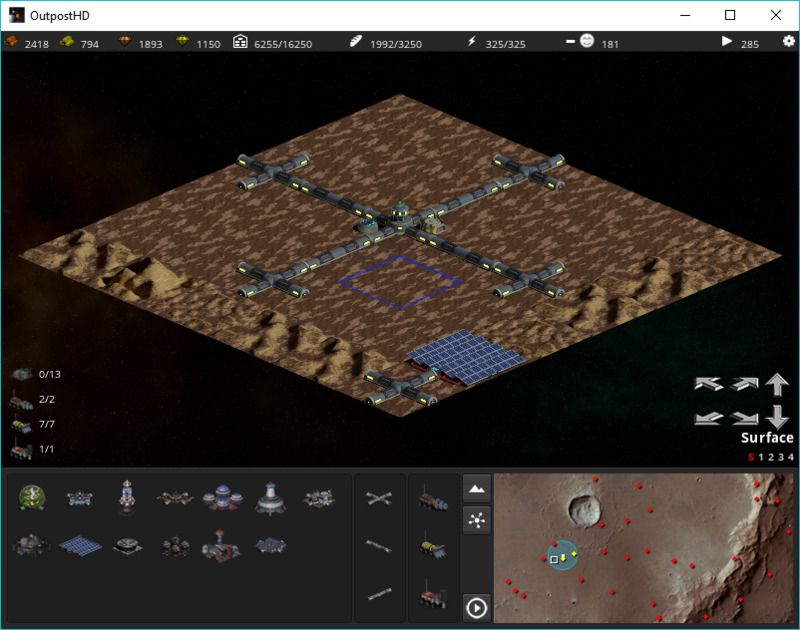 It was made to allow trucks way between mines and colony. Roads should be fairly simple, assuming they are just going to be pavement and maybe some lines. I'll start work on the UG versions soon(tm). And here it is in game. Now just to replace those underground structures. Gotta say that I really like these tubes. Look like something constructed. The originals looked like inflated balloons. Some adjustments to the tubes, with recent material changes and to match the new style. These are the above ground tubes. I've included two variants here, which primarily differ in the support structure. I've also included variations with a dark and light end cap, and blue vs. yellow lighting. I'm partial to the lighter end cap myself, as I think it provides more/better contrast. I really like these. They're simply nice to look at. All right, Leeor. How about this one? Wow, that looks really cool. It all just fits so nicely. There's a very definite overall style to these graphics. None of it ever seems to look out of place with the others. Took some tweaking and a bit of iterative trial and error but I think we're hitting that sweet spot where we've got them looking pretty good and popping off the terrain just enough to provide depth. Really digging the updated graphics, it's exactly what I was hoping for when I started this project! First pass at a comm tower. Looks good! A little monotone in terms of coloration. It first occurs to me that it might be a bit short but when you compare it to the scale of the other new structures it's actually a pretty large tower. Definitely like it. Shaft 01B definitely! I like the yellow, and with it toned down a bit, kind of gives the look that surface dust has started to stick to the sides of the structure. Enough color to distinguish it, but not overbearing. Like the basic design of the Comm Tower, but gotta agree with Leeor that it does look fairly "meh". Maybe a bit brighter with some small red flashing lights on the top and with each branch. Maybe even add a bright color to make it stand out. Can't recall what this building is either, so I'm throwing it in the support structures. And a comm tower variant, with a slightly modified color scheme. I've added one with a hint of green. That one may be good for continuity with the robot command center, which also has a small bit of green. Updated the underground tubes to the new materials and made them a little heavier. Heh, kind of looks like futuristic tents. I'm half expecting a Mongolian hoard of horsemen to come charging out. As for the comm tower, maybe you could have a Christmas tree mast as an Easter egg, in case anyone plays the game on Christmas. It could fit the color scheme. It could also provide some continuity with the "Santa Walking" graphics found in Outpost 2. This is the SPEW mk2. 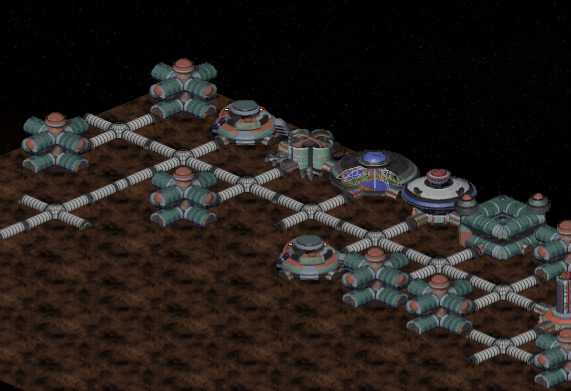 Will continue that tradition with OPHD though it'll be a general waste processing and recycling structure (no MPG, just small amounts of other refined minerals... and also required to keep the colony structures from getting gross with biological waste). Digging it! Going to use 02B... it has just enough color variant to keep it interesting. Definitely digging these updates. Much more pronounced and they look armored to handle falling rocks/soil/whatever you might expect underground. I like the new SPEW. May I suggest tryin a different color? Maybe bright aluminum or even gunmetal. Given its purpose, I think simple utilitarian would go well. At first glance, it looks like it will disappear into the terrain. I like the updated underground tubes. I agree that they look more armored. Would be too much grey in an already very grey and white structure scheme.